How is Thanksgiving already almost here? Yes, I know I say this almost every time a holiday arrives lately. But seriously, how? I have been seeing so many Thanksgiving dinner recipes that are making me drool, but something is missing from all of it–what about brunch?! Does anyone do a Thanksgiving brunch? Well this year, we are and I can’t wait to add this Pumpkin Pie Baked Oatmeal to the spread.Thanksgiving is going to look a bit different for us this year, very low key. So since we won’t be hopping house to house, a good brunch to start our first Thanksgiving as a family of three is in store. Obviously Sam will only be drinking milk, but Anthony and I will certainly indulge in the festivities. I am so grateful I cannot even handle it–more to come on that in next week’s Thanksgiving post, but I really am ridiculously happy to spend Thanksgiving with my favorite boys in the whole world. Anyone else out there hosting a brunch on Thanksgiving as well? Then you cannot serve a feast on Turkey day without pumpkin pie right? 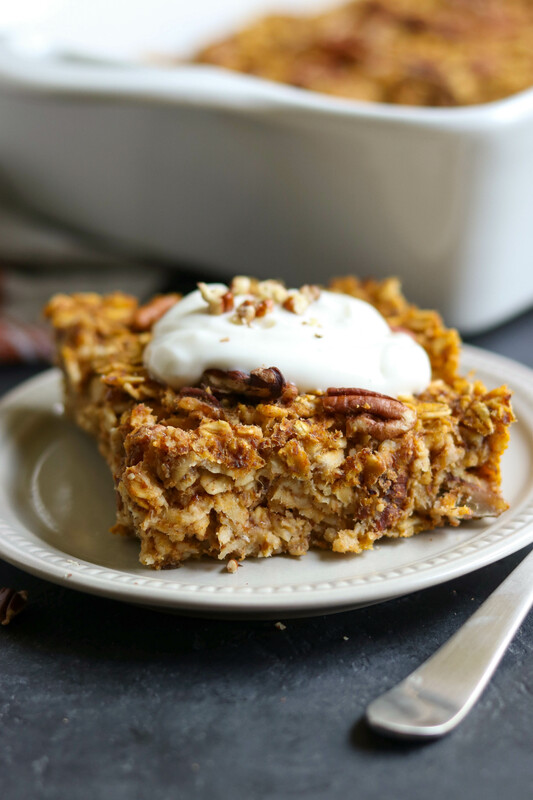 So this breakfast worthy pumpkin pie is for you! Just don’t forget the whipped cream like I did when I made it. I had to settle for some vanilla yogurt, but I REALLY wanted whipped cream. Consider yourself reminded. 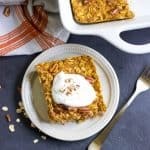 Lately, I have been shifting my oats to baked versions to switch things up. Baked oatmeal is what I consider oatmeal you can eat with a fork. Not quite cake, but not at all liquefied. You could almost grab a piece on the go, but then you will miss out on adding a touch of whipped cream and perhaps a maple drizzle that really seal the deal for this recipe. Maybe you set the alarm a tad earlier so you can sit down and enjoy. Pumpkin pie has always been my very favorite pie in the world. However, lately I have noticed that my taste buds are changing and nutmeg doesn’t seem to be doing it for me these days. So the whole pumpkin spice has not been my favorite. Cinnamon is always a go for me though so I have started using solely cinnamon versus the other spices that go into pumpkin spice. But if you want to have even more of a pumpkin pie flavor, opt for 1/2 tsp of pumpkin pie spice for part of the cinnamon. It will be amazing either way. And like I said before, don’t forget the whipped cream! In a medium bowl, combine pumpkin, milk, maple and vanilla and stir well. Add oats and all other ingredients and stir to combine. Spread evenly in a greased small baking pan (approx. 8x8) and sprinkle with more pecans if desired. Bake for about 30 minutes or until top of oatmeal is browned. Allow to cool and serve as desired. I like this even better than pumpkin pie! SO pretty and delicious! And still great with whipped cream!! It just makes sense! We are planning for 11! Dessert and breakfast in one, I love it! Now that you mention it, there is no reason we can’t have brunch foods at our Thanksgiving this year! We are eating extra early, like noon, because my sister has to work at the hospital, and now I am thinking this is the perfect addition to enjoy our brunch, thanks for the idea Lorie! Ha. I’ll take it all! Great breakfast option! The whole family will devour it! Such a delicious breakfast for Thanksgiving morning! Perfect start to the day! 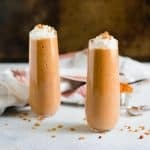 Hmm, we actually have some pumpkin spice milk beverage that needs to be used up – this might be the recipe for it! This looks so good! 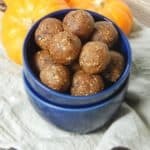 Pumpkin is such a great flavor to put in anything, especially baked oatmeal. It’s the perfect fall breakfast. Really can’t go wrong with pumpkin in the fall! We prefer to do brunch instead of dinner for Thanksgiving – I’ve never been a huge fan of the traditional dinner items. This would be so good for serving a crowd! 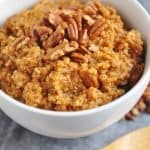 This makes a perfect breakfast, snack or dessert everyone will love!! Perfect fall treat. Yep. Perfect for a little bit of everything. 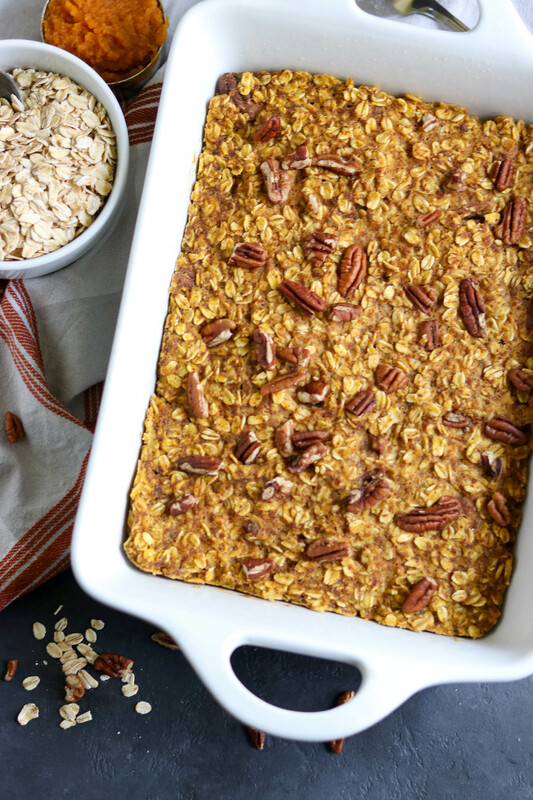 This is the perfect cozy fall breakfast!